We’d love your help. Let us know what’s wrong with this preview of The Jan & Dean Record by Mark A. Moore. 168 photos and illustrations; discography; appendices; bibliography; song index; general index; softcover; 454 pp. ; 8.5" x 11"
This is Jan Berry's biography. 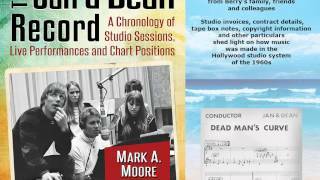 Based on years of research and primary resource documentation, the book chronicles Jan’s career as a songwriter and arranger—and his tenure as producer for Jan & Dean and other acts—with day-by-day entries detailin 168 photos and illustrations; discography; appendices; bibliography; song index; general index; softcover; 454 pp. ; 8.5" x 11"
This is Jan Berry's biography. 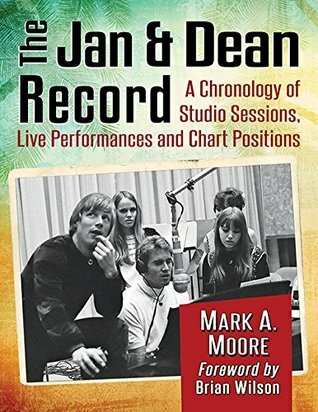 Based on years of research and primary resource documentation, the book chronicles Jan’s career as a songwriter and arranger—and his tenure as producer for Jan & Dean and other acts—with day-by-day entries detailing recording sessions, single and album releases, concerts and appearances, film and television projects, behind-the-scenes business and legal matters, chart positions and more. Extensive commentary from Berry’s family, friends and colleagues is included. Studio invoices, contract details, tape box notes, copyright information and other particulars shed light on how music was made in the Hollywood studio system of the 1960s. If you're a fan of the Wrecking Crew, this book is for you. Also included are full details of Jan's 1966 automobile accident and his return to the studio one year later. To ask other readers questions about The Jan & Dean Record, please sign up. I wasn't expecting to read a day-by-day chronicle of Jan and Dean all the way through. I picked up this book because Arnie Ginsburg, Jan Berry's performing partner for the first year of his professional career, is a relative of mine, and I thought it would be interesting to dip into that brief part of the story (my grandparents even have a tiny cameo). But I got pulled in by the details about the music business of the late 1950s and early 1960s, and the southern California music scene of the tim I wasn't expecting to read a day-by-day chronicle of Jan and Dean all the way through. I picked up this book because Arnie Ginsburg, Jan Berry's performing partner for the first year of his professional career, is a relative of mine, and I thought it would be interesting to dip into that brief part of the story (my grandparents even have a tiny cameo). But I got pulled in by the details about the music business of the late 1950s and early 1960s, and the southern California music scene of the time. And I was riveted by the story of Jan Berry's life. Jan, a genius kid who knew how to work the angles and bend the world to his will, started out making raw recordings in his garage and eventually became a respected performer, songwriter, arranger, and producer while attending college, and then medical school. Jan and Dean had a series of hits from 1959 to 1966, and then Jan was in a car accident that put him in a coma. When he woke up, he couldn't speak, and he was paralyzed on his right side. Over time, he learned to speak, walk, and read again, and was able to produce music and eventually perform again. Although he did not fully recover, he made tremendous strides and remained active in music until his death in 2004.